Congratulations to Julie Sampson and Meridy Taite on the win of their home-bred, Dr Brock, over 1200m at Geelong on Friday. Having turned five just the day before, Dr Brock is very lightly raced and was stepping out for just the third time in the Sportingbet Handicap. 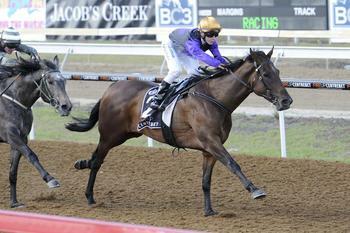 And a very impressive win it was – leading throughout for John Moloney and his pair of owner-breeders. First sighted when winning at Geelong in April, the Bel Esprit speedster resumed with a half length second at Geelong on 19 July and it will be interesting to see where he heads from here. Dr Brock is out of the Flying Spur mare, Gawne, a Melbourne stakes winner and multiple stakes placed for the Sampson/Taite combo and also a granddaughter of Group One winner Satin Sand.